In addition to launching radiosondes, the Atmospheric Soundings Group operates a Wind Profiler to observe air mass density directly above the radar. Each beam sends back a return and more returns indicate humid or rainy conditions. 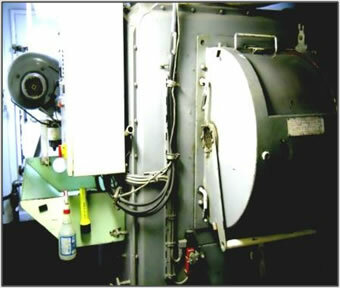 The wind profiler operates twenty-four hours a day on the ship. The wind profiling is revolutionary for this cruise in that 8 profiles per day will be performed by three people who are dedicated to this experiment. This detail will allow the scientists to see small scale variations in the atmosphere that have not been seen in the past with fewer profiles. Wind Profiler displays light winds and little air movement (left). Colors indicate high intensity and fast air movement (right). The image on the right was captured during an episode of rainfall. The Ocean Optics team is led by KG Fairbarn of the Earth Research Institute at the University of California Santa Barbara. KG does three optics casts a day using a Microprofiler. The data can be viewed on the computer in real time as the instrument is lowered through the water column to a depth of 50 meters. The Microprofiler measures the irradiance within the visible light spectrum. Irradiance is defined as the measure of solar radiation on a surface in watts/m2.The amount of irradiance absorbed within the water column is a function of chlorophyll and nutrients. The Microprofiler contains a flourometer to measure chlorophyll and KG obtains the nutrient content from water samples collected from the Revelle CTD. In terms of Project DYNAMO, KG is measuring light that penetrates a layer of water and heat that penetrates the ocean. This information allows scientists to quantify the heat distribution through the water column and relate it to the flux (transfer or exchange of heat) at the surface and flux at the air-sea interface. What is it like to live aboard a ship that is operating 24/7? There are negatives and positives. It is busy and often noisy. Doors are always closing and opening and the maintenance is constant. Privacy is non-existent. 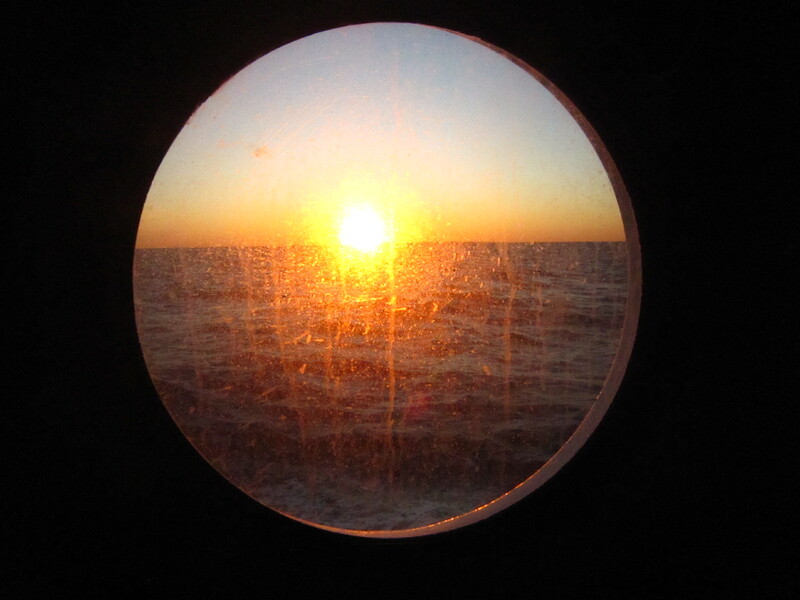 I often get up early and go on the bow to watch the sunrises and sunsets and to get some quiet time. However, I don’t have much time to ponder the negatives of life at sea as I am very busy familiarizing myself with and reporting on all 7 science groups. I work a split watch with the Ocean Mixing Group between 1500 and 2100. In addition, I am creating, posting, and grading assignments for my classes at Los Angeles Valley College. On a positive note, the science teams are interesting, happy with their work, and pleasant to work with. I share a room with another scientist where I have the top bunk. I share lab “office space” with the Atmospheric Soundings group, but float around the ship to the library and other spots for a change of scenery. There is always something good to eat and every day there has been a fresh salad bar at lunch and dinner. The cooks are really nice and try hard to please everyone on the ship which everyone knows is an impossible task. I find a quiet space to take notes. 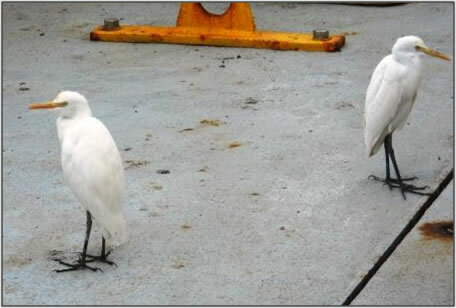 Sometimes we get visitors on deck. 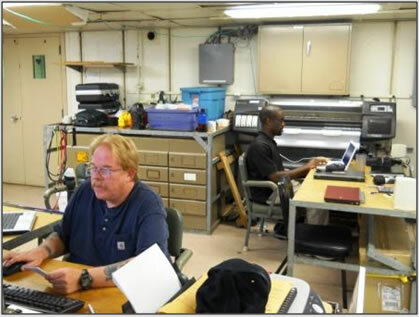 Office lab mates Lou Verstraete, National Center for Atmospheric Research (left), and Jonathan Wynn Smith, Ph.D. student, Howard University (right). I was surprised that non-plastic biodegradable materials are dumped at sea and there is a lot of it on a cruise that lasts this length of time. The plastic is burned on the ship in an incinerator. Also, the ship engines operate 24/7 to keep the ship in a fixed location (the term used for a fixed location is “on station”). 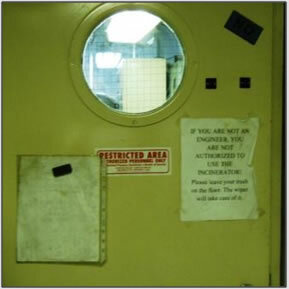 Entrance to the incinerator room. Overall, the positives outweigh the negatives on this cruise. 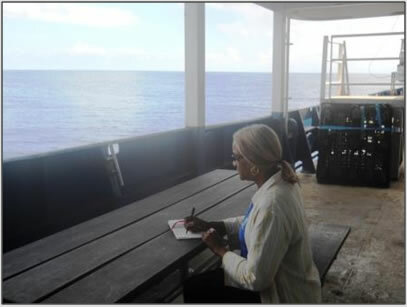 My work with the Ocean Mixing Group is going very well and the other scientists are extremely helpful and often contribute to the development of lesson plans for the classes I am teaching from the ship. The positive attitudes of these researchers more than compensates for any negative parts of the cruise. And, as I mentioned in a previous posting, there are endless opportunities for interesting photographs. The Revelle is now on station and will remain in this location for approximately 28 days to conduct measurements of surface fluxes, wind profiles, C-band radar, atmospheric soundings, aerosols, sonar- based ocean profiling and profiling of ocean structure including turbulence. Please note that the exact position and course of the ship will not be posted in this blog until Leg 3 has been completed and the ship is back in port in Phuket, Thailand. 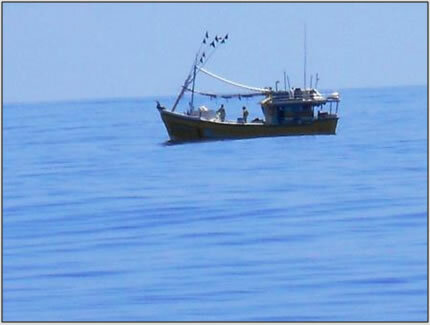 Although piracy is not anticipated at the station location, it has been a problem in other parts of the Indian Ocean and the policy is not to publicize the coordinates of the ship. The Surface Fluxes group measures the amount of radiation and heat into and out of the ocean. 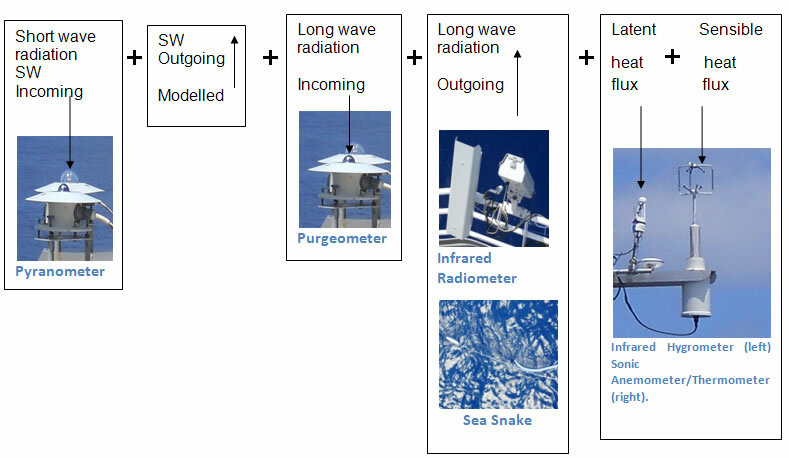 There are several dome instruments on the Revelle to measure atmospheric radiation, acoustic and propeller sensors to measure winds and a “sea snake” to measure the sea surface temperature. The term flux is defined as a transfer or exchange of heat. The sum of the terms in the equation below indicates how much radiation is in the ocean. If the sum >0, the ocean is warming. If the sum is <0, the ocean is cooling. Below each term is a photograph of the ship-board instrument used to measure it. Today I deployed the Los Angeles Valley College drifting buoy. Before leaving Los Angeles, the students in my introductory Physical Geology and Oceanography classes signed NOAA stickers that I placed on the buoy before releasing it into the Indian Ocean. A drifting buoy floats in the ocean water and is powered by batteries located in the dome. The drifting buoys last approximately 400 days unless they collide with land or the batteries fail. The buoy collects sea surface temperature and GPS data that are sent to a satellite and then to a land station where the data can be accessed. Drifting buoys are useful in tracking current direction and speed. Approximately 12 drifting buoys will be deployed from the Revelle during Leg 3 of the Project DYNAMO cruise. Can you have pirates before a pirate drill? After we arrived on station, a science meeting was held to provide instructions regarding safety and emergency procedures for mandatory drills such as fire safety, abandon ship, and pirate drills. Drills are typically scheduled once a week and we have already assembled for a fire drill. A pirate drill was scheduled for the following week. 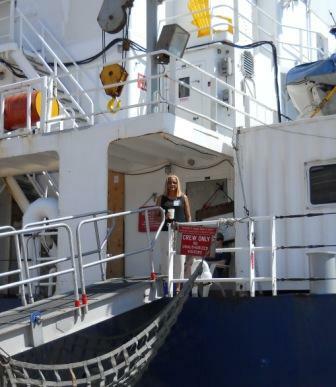 I began my orientation working with the Oregon State University Ocean Mixing Group. 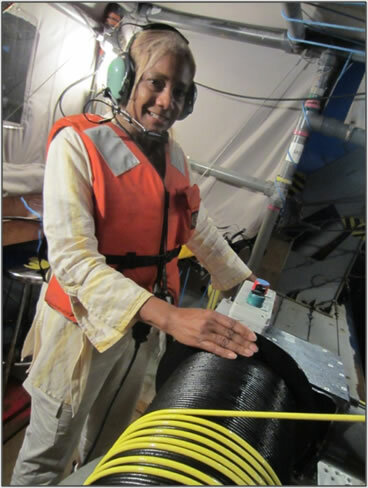 My role on the research team is to assist with the operation of the “Chameleon”, a specially designed ocean profiling instrument that is continuously lowered and raised to the surface taking measurements while on station. My job is to rotate between operating the winch (used to lower and raise the instrument) and the computer station. The computer station operator is in constant communication with the winch operator and tells the operator when to raise and lower Chameleon. In addition, the computer operator logs the critical start and end times of each run and keeps track of the depth of the instrument. Jackie operates the winch. My goal is to keep the instrument safe and have a perfect wind. I was just beginning to learn to operate the winch when an alarm sounded followed by the words “Go to your pirate stations, this is not a drill, repeat, this is not a drill”. I must admit I was a bit stressed. When I came on this trip, I knew there was a remote risk, but I thought it was extremely remote. Everyone assembled in the designated area and it turns out that a fishing boat was approaching the ship and the Revelle does not take chances if the boat appears to be approaching boarding distance to the ship. There have been two instances where we have assembled for safety following the alarm and the words “This is not a drill, repeat, this is not a drill.” In both cases, fishing boats were too close for comfort. As I began operating the winch, I watched a fishing boat off in the distance for a few days and became more comfortable knowing that the ship is taking extreme caution to protect all on board. All this excitement and before we even had a pirate drill! But all is well somewhere out here on the equator and the Indian Ocean provides many opportunities for photographing amazing sunrises and sunsets. I arrived safely in Pascagoula Mississippi. I was met by an awesome and enthusiastic group of scientists from the Southeast Fisheries Science Center (SEFSC). Unfortunately I was told the ship had a problem with its water heater and the cruise may be in jeopardy. I had a tour of the lab and saw the OREGON II from the dock. All I could do was wait. OREGON II at the Pascagoula, Miss. SEFSC dock awaiting repair. A current drifter we lowered off the RV Walton Smith. At a couple of stops on the cruise we dropped some current drifters overboard. These current drifters will float at the surface of the water and travel with the gulf current. On top of the drifter there is a transmitter that will send a signal to a satellite. The scientists can then track movement of these drifters and map the ocean currents. This drifter, I learned, was simply made. The materials, except for the GPS transmitter, can be found at a local hardware store and tackle shop. 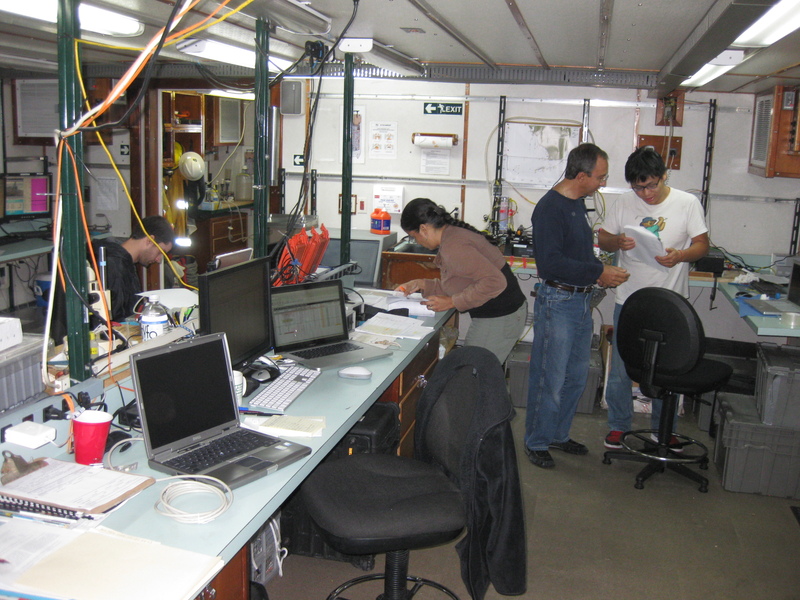 (from left to right) Brian, Maria, Nelson & Kuan at work on the RV Walton Smith. My cruise with the R/V Walton Smith has been exciting. 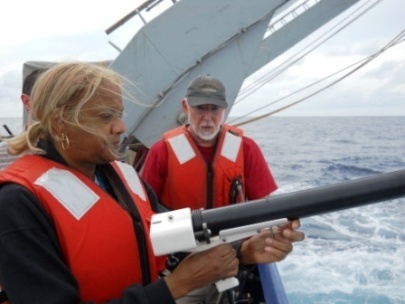 It has been great to learn how science — in particular oceanography — is done. Scientists are dedicated, focused people. I can tell they love what they do. The crew of the R/V Walton Smith are incredible. I have a lot of respect for anyone that can parallel park something the size of a house. Talk about teamwork! 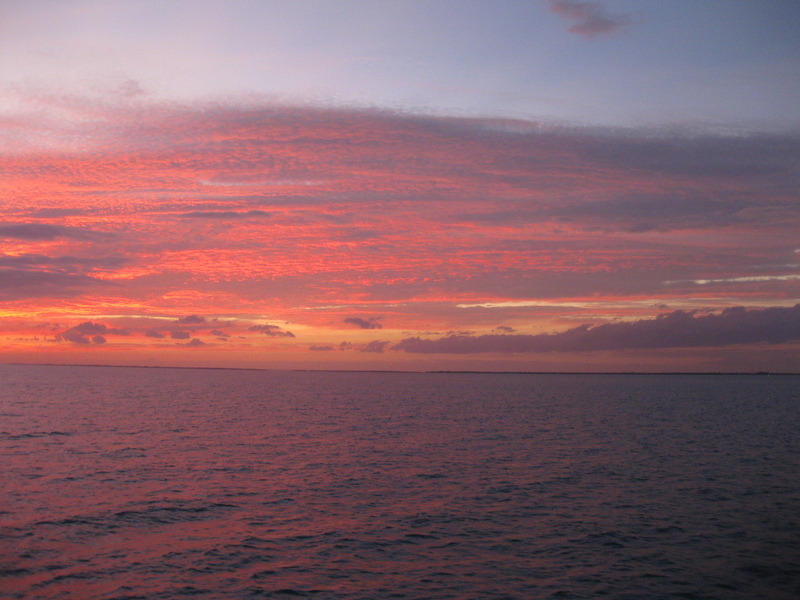 To finish off, here are some sunset photos taken on the voyage. Collecting data is what science is all about and scientists can measure many different things from the ocean. They generally take these measurements in two different ways: discrete and ongoing samples. Cheryl is preparing filter samples made from water collected with the CTD. These samples will be frozen and analyzed later in a laboratory on shore. Discrete sampling means scientists will take samples at different times. When we take measurements at regular intervals, we can compare the data and look for patterns. 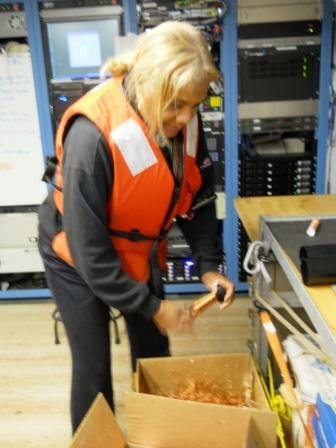 On the R/V Walton Smith we take discrete samples each time the CTD is lowered. At approximately every two weeks RV Walton Smith will revisit the same location and collect data again. These bi-monthly data samples will let the scientists compare the data and look for patterns. Remember when we collected weather data in class? We were also doing discrete sampling. We collected weather data from the morning and afternoon each school day. We would record precipitation, wind velocity and direction, air temperature, barometric pressure, and cloud types. Remember the pattern we noticed? When the afternoon temperature was cooler than the morning, we would have precipitation the next day. 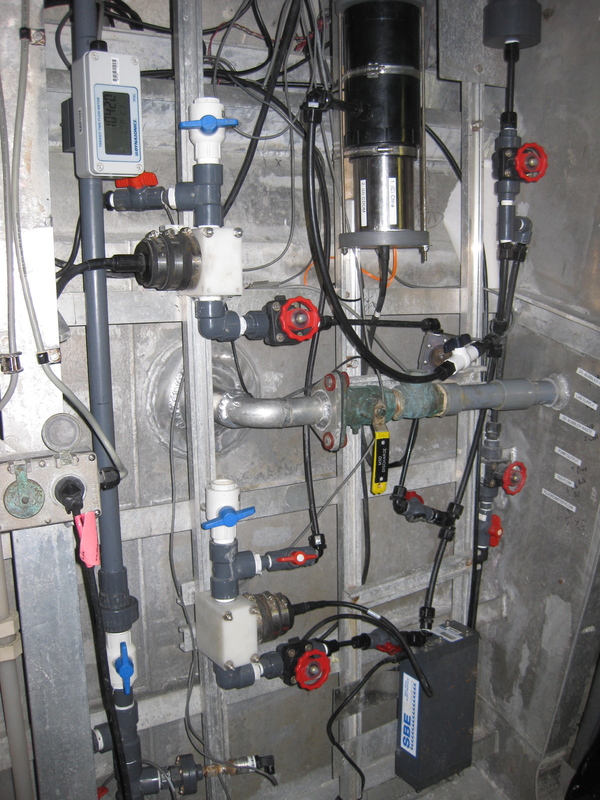 Here is the pipes, valves and instruments used to take ongoing samples of surface water. Ongoing sampling is also done on the R/V Walton Smith. On the fore, port (the left front) side of the ship, ocean water is continually sucked into some pipes. This surface water is continually pumped through instruments and water chemistry data is collected. 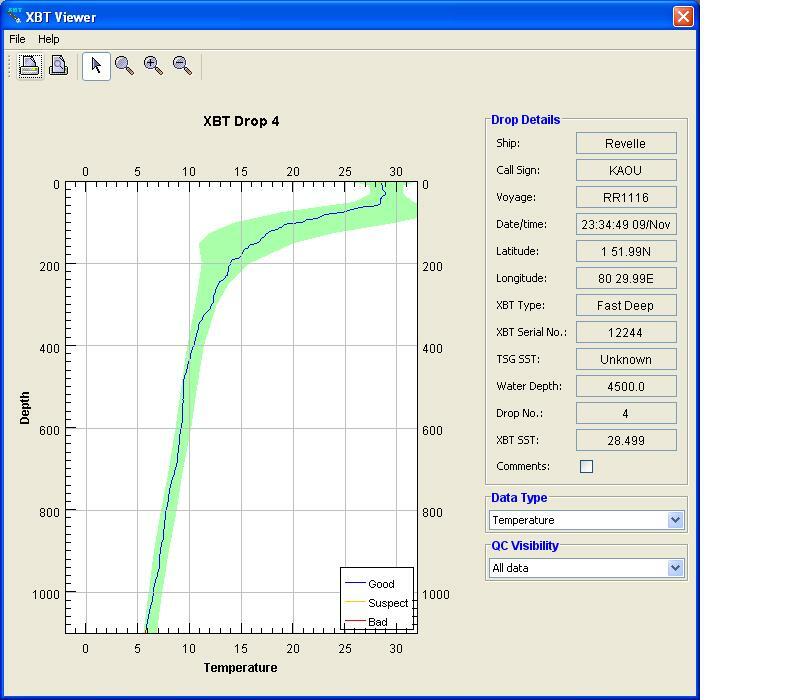 This continual data sampling is recorded on a computer and graphs can be made for different characteristics of water chemistry. When continual data is graphed, the graphs have a smoother shape than they would with discrete samples. 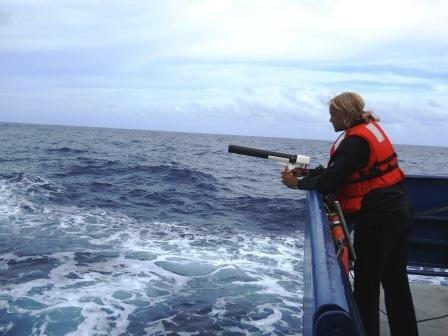 Initially I thought that we were just collecting data each time we stopped to lower the CTD. Actually we had been collecting data throughout the entire voyage. Kuan is monitoring his ongoing data collection of dissolved inorganic carbon. 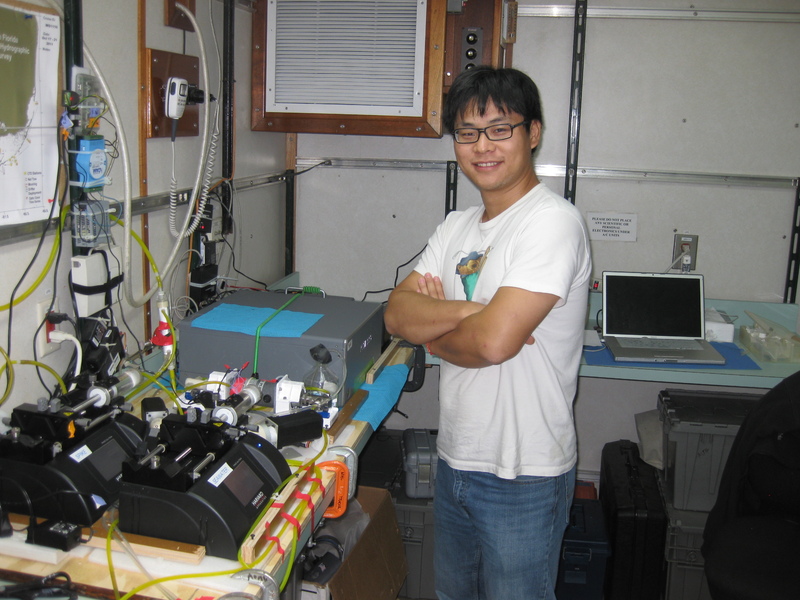 Kuan, one of the scientists on our cruise, was measuring the amount of dissolved inorganic carbon in the ocean. The process of doing this has typically been a discrete sampling process that involves chemically analyzing water samples, Kuan has developed an instrument that would take ongoing water samples and measure the amount of dissolved inorganic carbon continually. His instrument would tap into the water pipes above and take ongoing samples throughout the trip. He also wrote a computer program that would record, calculate, and graph the quantity of dissolved inorganic carbon. He even collects GPS data so he can tell where in the ocean his samples were taken. His experiment, I learned, is cutting-edge science or something that hasn’t been tried before. I hadn’t realized the close connection there is between our earth’s atmosphere and its oceans. I understood how the ocean temperatures and currents affect our weather systems. But, I didn’t understand how on a micro scale this happens as well. 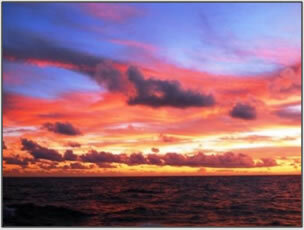 The ocean will exchange (absorb and give off) carbon dioxide and many other molecules with the air. 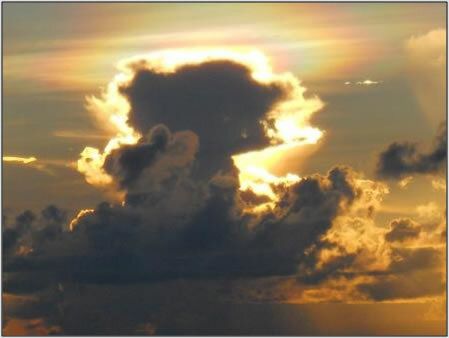 Understanding the interaction between atmosphere and ocean will help us understand why some areas of the earths ocean absorb more carbon dioxide and others don’t. 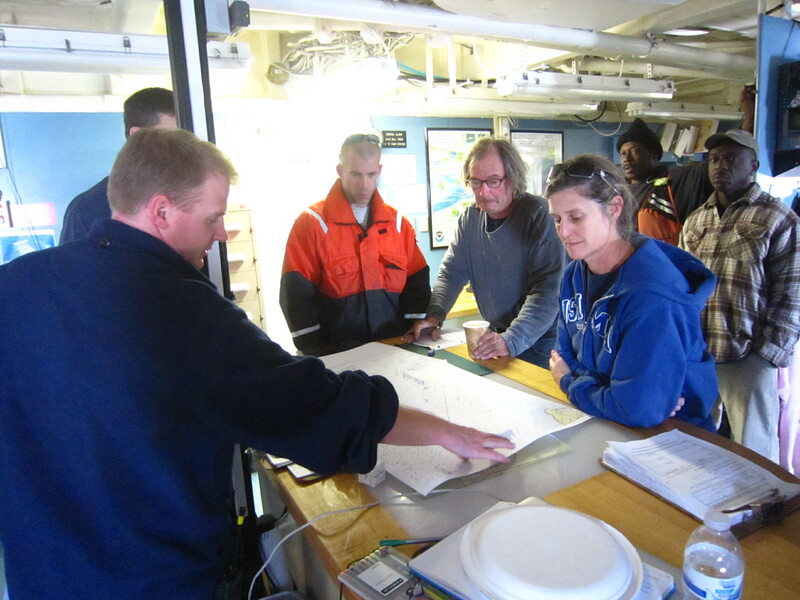 My primary role on this cruise is to work with the Ocean Mixing group led by Dr. Jim Moum from Oregon State University. The Ocean Mixing Group is responsible for sonar measurements of ocean current profiles, high frequency measurement of acoustic backscatter, turbulence/CTD profiling instruments and near surface CTD (Conductivity, Temperature, Depth) measurements. I will be working with other scientific groups as needed and have organized my Teacher at Sea blog to report on daily activities by science group. We have been cruising for a couple of days to the sampling station in the eastern Indian Ocean and are still within the Exclusive Economic Zones (EEZ) of Thailand, India, and other countries. Here is an interesting fact that I learned about the EEZ – it not only applies to resources, but also applies to data collection. What this means to the R/V Revelle, is that the scientists cannot collect data until the ship clears the 200 nautical mile EEZ for the counties. 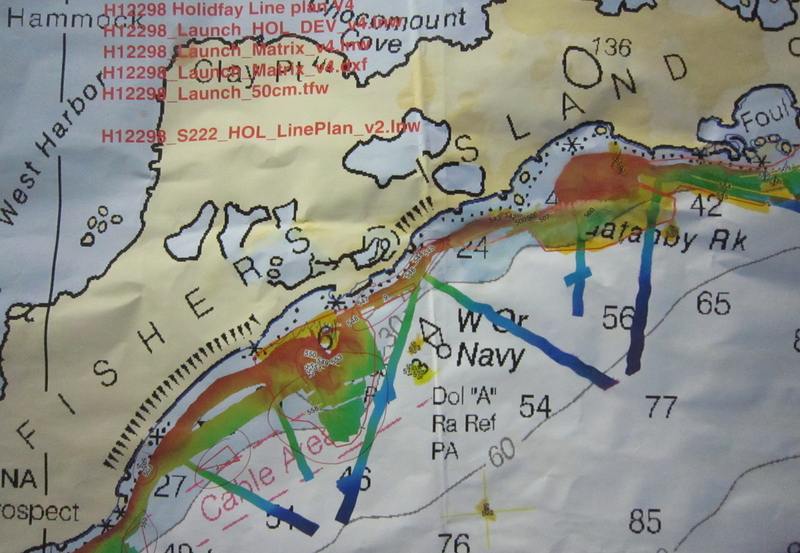 After clearing the EEZ, the science groups can begin data collection. Data collection began on the ship on November 8 and one of the first groups I observed was the Atmospheric Soundings group. This group is responsible for launching radiosondes using helium balloons (weather balloons). 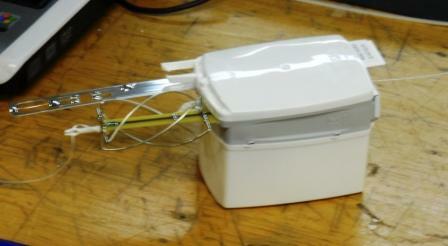 A radiosonde is an instrument that contains sensors to measure temperature, humidity, pressure, wind speed, and wind direction. Although the balloons can hold up to 200 cubic feet of helium, on this cruise, each balloon is filled with 30-35 cubic feet of helium. As the radiosonde ascends, it transmits data to the ship for up to 1 ½ hours before the weather balloon bursts and falls into the ocean. The weather balloons have been reaching an average altitude of 16 km before bursting. Approximately 260 weather balloons will be launched during Leg 3 of the cruise. 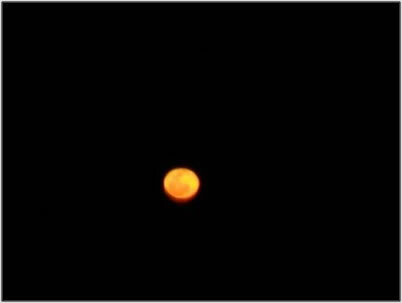 Watch the video clip below to watch the deployment of a weather balloon. Computer screen shot of radiosonde data. Temperature is red, relative humidity in blue, wind speed is in green and wind direction is purple. 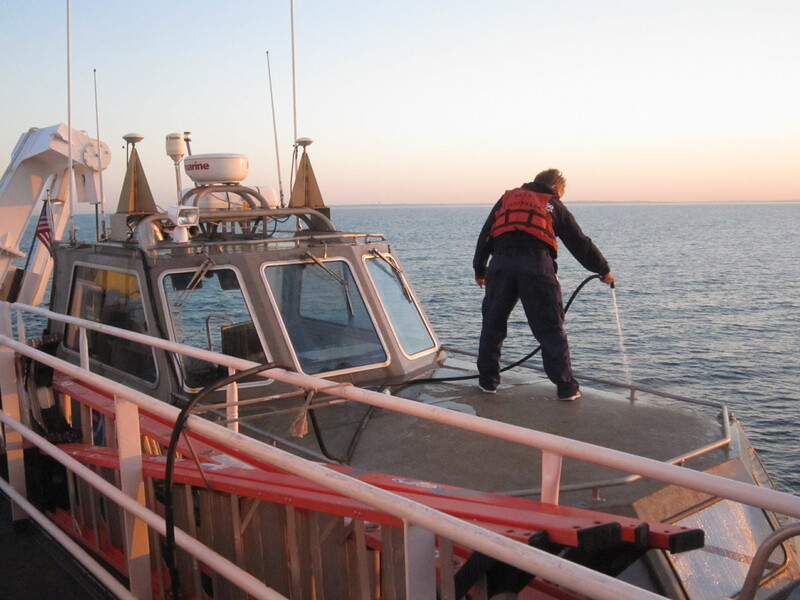 The Ocean Mixing group began the deployment of XBTs (Expendable bathythermographs) on November 10, 2011. 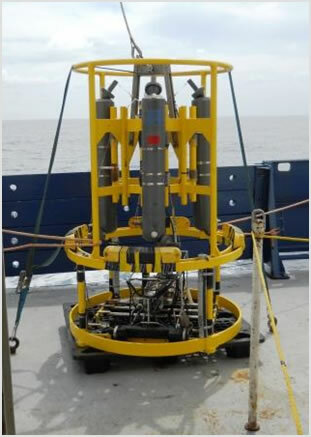 XBTs are torpedo shaped instruments which are lowered through the ocean to obtain temperature data. The XBT is attached to a handheld instrument for launching by a copper wire. Electronic readings are sent to the ship as the XBT descends in the ocean. When the XBT reaches 1,000 meters, the copper line is broken and the XBT is released and falls to the bottom on the ocean. First step in getting the XBT ready. Here I am getting ready to launch the XBT. 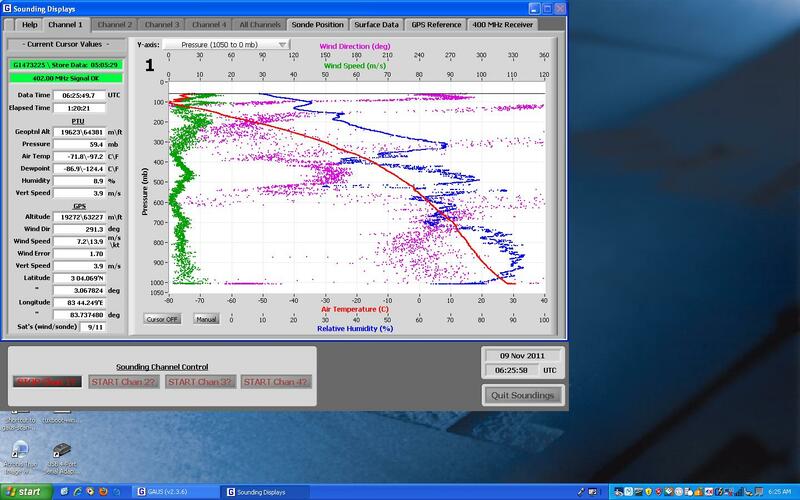 Computer screen shot of thermocline (change in temperature with depth) obtained from XBT instrument. The green shaded curve displays the historical record for comparison. I arrived in Phuket, Thailand on November 3, 2011 after a 19-hour plane ride. After dinner and a good night’s sleep, I went to the ship to get acquainted with my new home for the next 6 weeks. 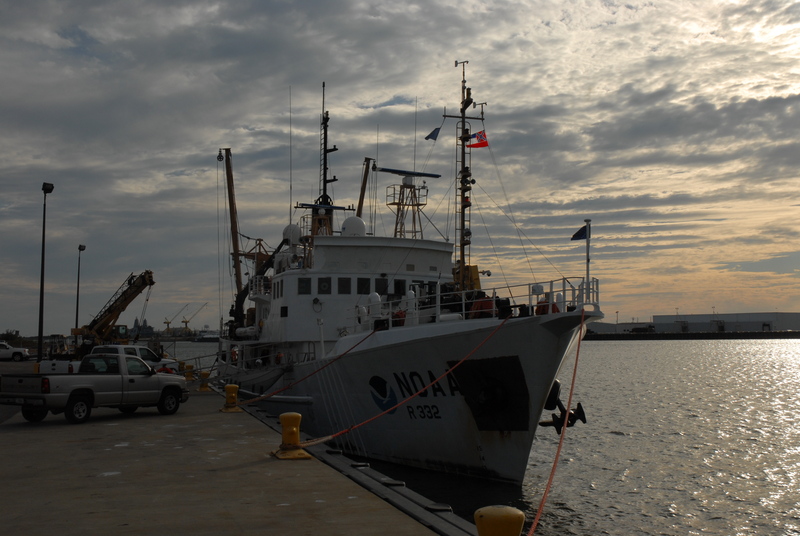 Select the link below for a tour of the R/V Revelle. The Revelle sailed from Phuket on November 6. 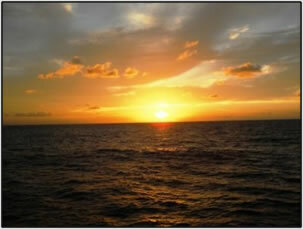 As the ship sailed to station, I captured the beauty of the Indian Ocean. A beautiful day on the Indian Ocean. Monday started with my alarm beckoning my eyes to open at 4:15am. I found my right pointer finger hitting snooze not once, but twice, only to finally move myself from the medium of a dreamlike state to a stand-up position at 4:36. I made it to the galley for breakfast and a safety brief for the 3102 launch. Safety Brief. Mapping locations and surveys to be accomplished along Fisher Island. Today I will be joining COXSWAIN Tom Bascom and HIC Matt Vanhoy to perform near-shore surveying on sections that have both holidays and missed information. Holidays do not mean we will be scanning for Santa’s missing sleigh, or find Columbus’s ship Santa Maria run aground, but rather areas that have been previously surveyed and unfortunately recorded absolutely no information. Holidays occur sometimes due to rough seas, oxygen, as well as possible rocky ocean floors. After Tom, Matt, and I were lowered in the 3102 by the davit and help of the TJ crew, we went to Fisher Island and began the slow mowing movements of surveying. The ride to Fisher Island was incredibly bumpy and the entire deck was wet from the swells pushing up at the bow. 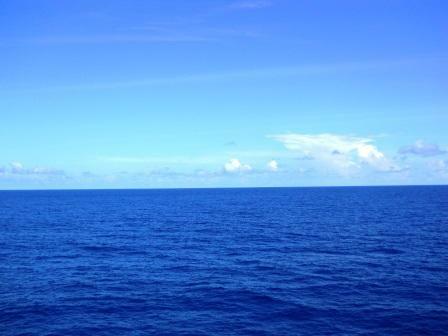 Currently there are winds upwards of 16 knots and a chill in the air. Vanhoy is below deck in the surveying room and Bascom is manning the boat. Me, well, I am observing for now and loving the chaotic changing seas. After about 2 hours on deck with Tom I went below to the survey room… that lasted about 20 minutes. I became really sea sick and returned to deck with Tom. Matt told me that he often gets sea sick while surveying on the launches and will come up to the stern, puke, and continue on through the day (wow). When you are on a launch the motions of the ocean are magnified and you can feel the movements much more so than on the ship. While we were passing by the massive houses located on Fisher Island, Tom commented that unless there is love inside the homes, they are like the numerous clam shells we find already emptied and eaten by fish and gulls. He said that peace and happiness is not a large house, but the land that surrounds the home. Tom has been on the open waters for the past 30 years and has found solace in simplicity. He is a determined individual who presses on and is concerned with following protocol and ensuring the safety of those around him. After lunch we finished our survey sections and still had 3 hours before needing to return so went around the area and collected bottom samples. Bottom samples (BS) is probably the most fun thing I have been able to help with on the ship. 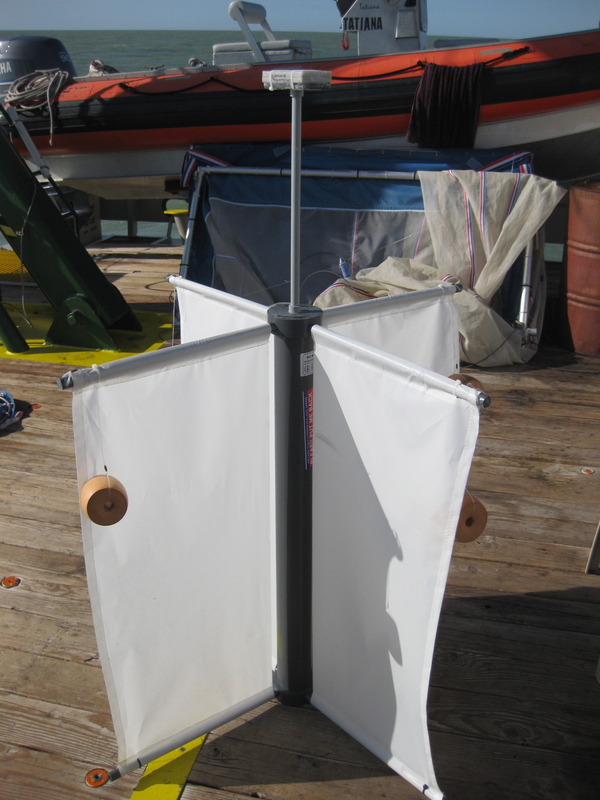 We used a device called the Van Veen Grab system and lowered it into the water. When we thought the Sampler was in contact with the ocean floor we pulled a few times up and down on the line and then hoisted the grabber to the deck. The bottom samples are taken for the fisheries division as well as for ships that are interested in areas that they will be able to anchor in. For the most part we pulled samples of course sand and broken clam shells (I hope this is no reflection of Fisher Island). The further away from the shore line we went the more courser the sand became as well the more rocks we sampled. Most of the rocks were metamorphic and consisted of marble and a little quartzite. This surprised me given the location. I though most of the rocks would be sedimentary based on the surrounding topography and surface features. I appreciate Tom and Matt taking the time to review and connect me into each process. Tom taught me how to drive the launch… that was really FUN. With all of the monitors it was hard to discern between reality and a glamorous video game. Radar showed me where I was going, and a survey map outlined the areas I was trying to move to in order to take the next bottom sample. Watching everything at once is not easy to do because you also have to pay attention to the waters. The shoals (shallow waters) often have “pots” which are lobster traps placed everywhere. The pots have a cage on the bottom of the ocean floor and a huge buoy at the surface so you can locate them and steer clear of them. 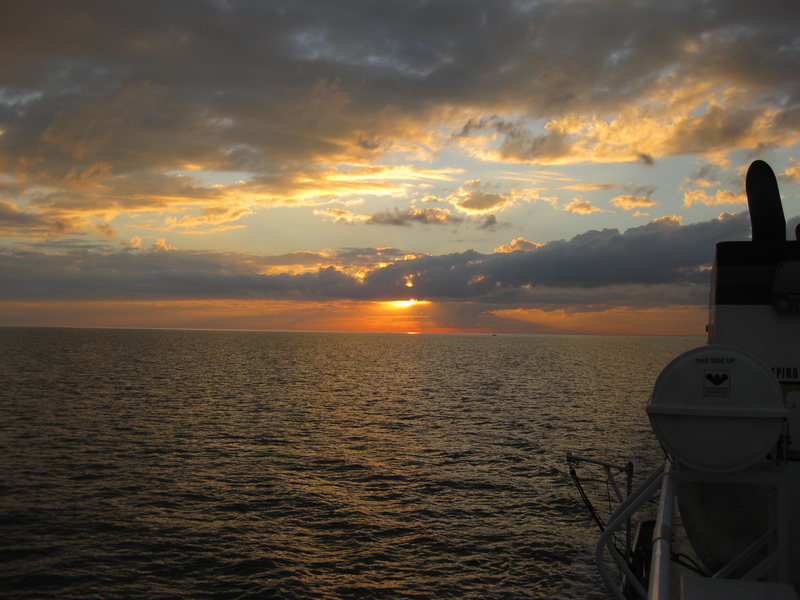 Upon returning to the ship, I watched yet another amazing sunset and Matt take the survey data from the ship and upload it on the ship’s network while Tom and ENS Norman hosed down the salt from the deck and prepped the 3102 for a new day. ENS Norman Hosing down 3101 after surveying Fisher Island for the day.